It’s been two years since we last heard from Ronan Harris and Mark Jackson. During this time, time has obviously been spent thinking about how to take the trademark VNV sound further, and the resulting “Automatic” is in a way both a step forward and a stand still. It’s breaking new ground in that it is more pop oriented than ever before, with sweeter melodies. It’s status quo in that the sound is still so very much VNV Nation. You can listen to the first ten seconds of a track, and you know what to expect. While this might be considered a plus - i.e. they have their own sound - it also make you wonder why they’re not trying to reach higher sonic stratospheres as well. The problem of being a reviewer is that you might overthink things. Maybe I just should let go and soak the music up, let it caress my ears without interference. 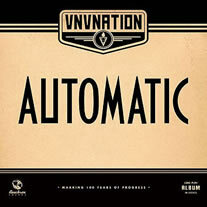 The thing is, on “Automatic” VNV Nation make music which employs predictable chord changes and sugary melodies, making it perfect for just consuming without thinking. I miss the edgy and furious "Empires", but I have to be honest - they still can make stonking good songs, no doubt about that. "Resolution" and "Gratitude" fall in the "predictable" category, as in "I can sense the chord change before it happens", but damn are they catchy anyway. Let go Johan, let go. Don't overthink. The thing is though, the lyrics are deep, thoughtful and opens up to a lot of interpretations, which contrasts a bit with the "fluffy" music. One of my favourite VNV Nation songs ever is “Beloved” which strikes a nice balance between hard beats and a fantastic melody. There is no track here that comes close to that one, but all in all it’s still miles ahead of what most other bands in the genre can muster. And the album cover is excellent.